You chose your current hair care products because they work great for your hair type, and reading good reviews about them beforehand didn’t hurt either. One of the things you might have been looking for was something that would add moisture to your otherwise dry locks, especially in the summer! But just what makes a good hair moisturizer, anyway? Is it something you can buy and use alone? You can actually make your own moisturizing hair masks once you figure out just what it is that moisturizes your hair so well! Here are some of the top ingredients that help to moisturize your curls. Glycerin is an ingredient that binds water together. Naturally, this means it’s instrumental in locking in moisture in conjunction with the other ingredients in your products. 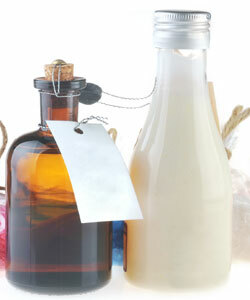 You can also use glycerin to make soaps (those clear kinds of soap) and lotions. In both soaps and lotions, glycerin helps moisturize your skin. You might also see “vegetable glycerin” listed on a product label instead. If you get sunburns easily, you’re probably most familiar with using aloe to soothe your skin. If you’ve ever plucked an aloe leaf, you also know that the stuff you buy in the store smells much better than a fresh aloe plant! Nonetheless, aloe (also known as aloe vera or aloe vera juice) has great moisturizing properties as well. In addition to helping your hair grow, it also helps maintain your hair’s natural sheen and luster by locking in your hair’s natural oils. Avocado actually has many benefits for the body. It’s a good fat and is a great addition to a low-carb diet. Additionally, avocado is useful in trying to recover damaged hair. A few drops of avocado added to your favorite shampoo can also turn that shampoo into a very moisturizing concoction. If your scalp is itchy and needs moisturizing, you can also rub a few drops into your scalp for relief. You’ve probably already discovered that washing your hair on a daily basis isn’t a good idea — especially if you’re already dealing with dry hair. The reason for this is that your scalp produces a natural oil called sebum that keeps your scalp and hair moistened. Jojoba oil is very similar to this natural sebum. In fact, even its molecular structure is similar! You’ll find shea butter, a natural carrier of vitamin A, in almost any hair moisturizer because it physically holds in moisture. For our coilies, who tend to have thick, dry hair, shea butter is often a godsend. While these ingredients will add moisture to just about any hair type, remember that not all ingredients work the same for all hair types. You might swear by a certain ingredient while another curly can’t stand it. Remember keep in mind your hair's porosity level and thickness as well when choosing products. Do you have something to add to the list? What are your favorite moisturizing ingredients?